Scrubs is in national syndication and on Comedy Central, five nights a week! Local listings are available at www.watchscrubs.com. 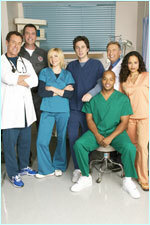 Last week's episode: "My No Good Reason "
Check out blogs, webcams, and info from the set of Scrubs! Decorate your desktop with SCRUBS!